Registration is $30. Pre-registration is $20, $15 for Huntsville Car Scene members. 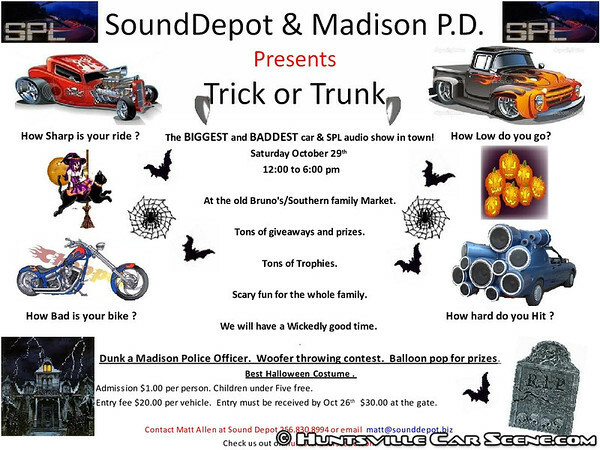 Pre-register by Oct 26th at Sound Depot and receive your event card and extra raffle ticket. Registration includes both car show and SPL Audio. Spectator admission $1 per person over 5yrs old. Thousands of dollars of giveaways and prizes, and tons of trophies. Classes will be decades and types. Imports, domestic, modified, classic, bikes, trucks, with awards for top 20, spl audio will be single sub, 2 sub, 3-5, 6-8, 9 and up, amateur and pro class with 1st and 2nd place awards. In addition there will be peoples choice as well as Dave's choice. In addition to the show there will be a dunking booth for a Madison Police Officer, a woofer throwing contest, balloon pop for prizes, best Halloween costume, and more. And thank you for the post! What kind of classes are you going to have for the car show and spl contest? After talking with many people around town and reading the post about registration. I have decided to lower the fee to 15.00 if you per-register by the 26th of Oct. This will be for Huntsville Car Scene Members. Awesome! I'll add this to the listing. Will the registration fee be lowered overall? thanks for discounting it for us....no answer to my question though. Thank you for the update! Listing updated. I just saw signs on 72 for this show and bumped into Matt, and he's got TONS of high dollar door prizes. Time to call that distributor and get a tracking number. I stopped by for a bit. Saw some nice cars. Was a good show, looking foward to next years , hope there is a next years.. Liked the spl contest too. We had a great time out there. Big thanks to Rodney (cheesepuff) for bringing his car out there and park with us! Glad to represent you guys beck,big thanks for inviting me. Did anybody take any pics?